Spiders are not a nuisance in the garden, but instead are a pest to the pests. If you keep out of their way and let them do their business, these long-legged creatures are an outstanding garden control partner. Possessing two body divisions and four pairs of legs, with no antennae. There are both males and females, who do mate and lay eggs. All eat prey, usually insects. Killing their food with venom. All like dark, moist, sheltered environments. Will avoid humans and only bite when provoked. Other than the size, shape, and colors of the different species, one of the other main differences is in their hunting behavior. Some spiders actually stalk their prey, while others build webs and wait. Not all actually even make silk and different web building types can create different shapes of webs. 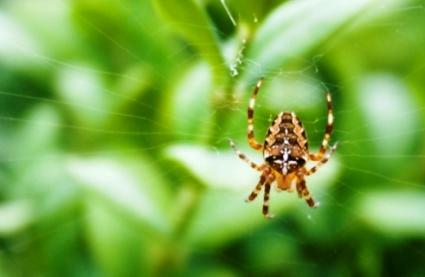 Spiders are a true organic gardeners dream, as they are the perfect natural pest control available. An ally in your fight against destructive garden insects, arachnids should be protected at all costs. Be particularly careful when spraying plants with insect control products and double check that you aren't accidentally destroying your friends. Also, avoid broad spectrum pesticides for this same reason. Building houses. Turn over terra cotta pots, create twig or stone mounds, and place wood crates in vegetable rows. Mulch with grass clipping and compost. Spiders love the warm, moist, mulch environment, plus it is good for your plants too. Place these prime spider homes in areas that you need the most insect control. They will help you by feeding on earwigs, sow bugs, beetles, larvae and more. Also known as Harvestmen, these harmless spiders come with a very friendly name. One of the most dissimilar of all the species, it completely lacks silk glands. They rarely hunt, mostly feeding on dead insects and sometimes plant fruits. A broad type, it includes the more common Wolf Spider. Often found in your home and garden, jumping species don't use webs for catching insects, but instead hunt their prey. A very helpful species, they received the nickname "jumping" due to their technique of using their silk to hang and swing, along with a strong ability to leap quickly. Another expansive type, the renowned Brown Recluse Spider falls into this category. Some of the most poisonous varieties, they love flies and other insects. They will build their webs in corners and sit to wait for dinner to come flying or creeping by. Due to the abundance of this well known spider, it has a category all its own. Their painful bites can cause death in some cases, but they are very shy and only attack when provoked. They build their nests under objects, close to the ground. The female is the only one with the recognizable red mark on its back.